This is part two of our four-part Critical Use Cases blog series on improving the mobile user lifecycle, through improved strategies for onboarding, engagement, and conversions. If you missed part 1 of the mobile app use cases, here’s a quick six-minute read on Mastering the First-Time User Experience. Your new user onboarding strategy is crushing it, and you’re retaining more than the expected 20 percent of users who downloaded your app. Users trickle in and out of the app though, and your boss relies on you to improve user engagement and retention. Questioning the relationship between your users and your app is a smart move, so ask yourself a handful of questions kickoff your strategy. When should I remind them that they should come back to the app? How do I motivate users to convert sooner? 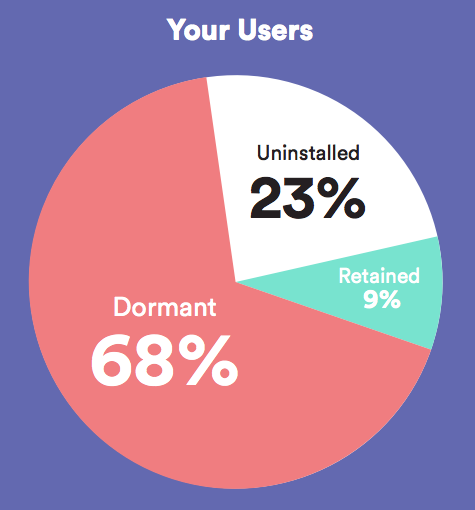 What can I do to reactivate dormant users? My loyal users are awesome, but how do I improve that relationship? No need to lose sleep trying to answer the questions above. Simply put, it’s time to delight users with personalized messages. Get them even more excited about the experience you’re creating by speaking directly to them with highly relevant messages. Get specific and acknowledge their unique achievements, make loyal users feel like VIPs, and let them know you miss them without being creepy. Brace yourself for this one. 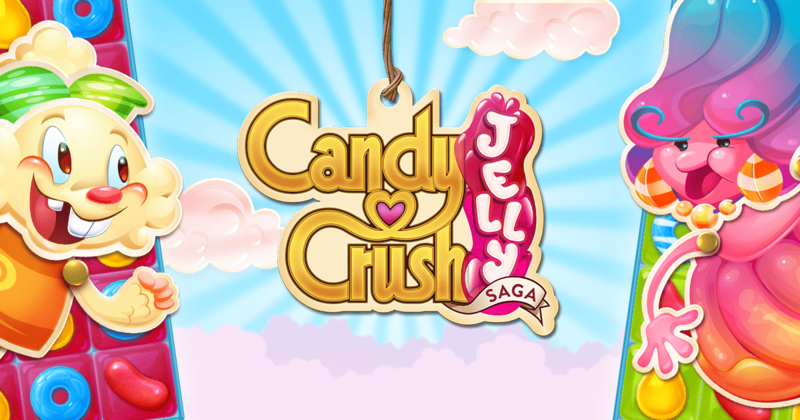 Two out of every three of users will have less than a few sessions in an app. Don’t take it personally, though. Your app is just too good for people to realize without your help. If you catch a user in the moment and celebrate their achievements with in-app recognition, they’ll spend 10 percent more time in your app. Increasing enjoyment and delighting users deepens the relationship with users, and will go farther than you imagined. Tip: ‘Just because’ messages may be sweet, but highlighting specific achievements will motivate users to accomplish even more in the app. 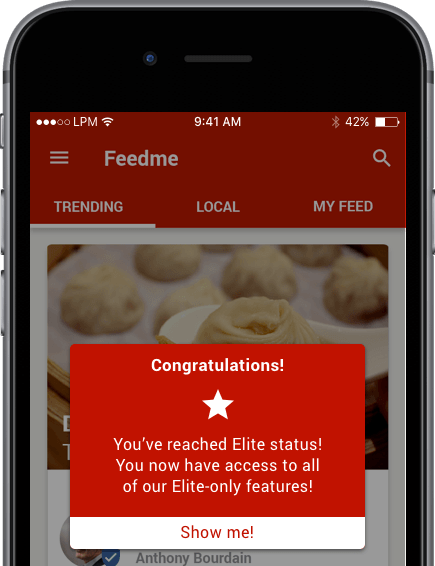 All while a user is in your app, they’re achieving significant milestones. These milestone achievements come in many forms and are specific to your app — reaching level 28 for games; completing half of a dating profile; or booking the first flight in a travel app. If you take the opportunity to make each one of those moments special, you’ll see the ROI in the form of extended session length, improved retention, and spikes in conversions. It’s the thought that counts, but let users know you care by setting up in-app messages that validate app engagement when they’ve accomplished something great. You can also use these moments to deliver special rewards to improve the likelihood that they’ll become loyal lovers of your app. Happy users, happy life. On average, only 15 percent of monthly active users visit an app daily, and all your app events could be overlooked if users are not notified. 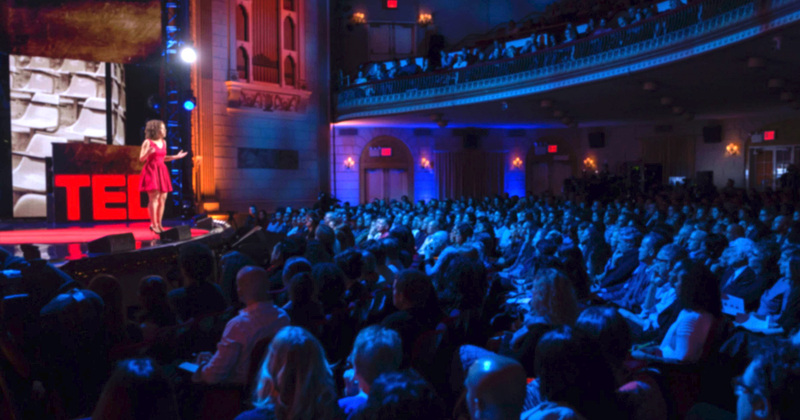 Would you host a party, forget to send the invites, and then expect hundreds of thousands of people to show? No, so let’s not assume that users will come to your app without notice either. Notify them that an event is coming or is currently happening to make your messaging a valuable communication tool to the users. Tip: Engage users in the moment. Trigger in-app messages or push notifications informing them of the times events are taking place. Your users want to be informed of exciting moments, and it is up to you to alert them of these topical times. Sending gentle reminders about the events in your app helps users see the value of your communications, and engages them in the moment. Let’s imagine you’re the marketing manager for the world’s most exciting dating app. Your boss wants to boost daily retention. You get a stroke of pure genius to optimize the messaging strategy with time-based reminders. 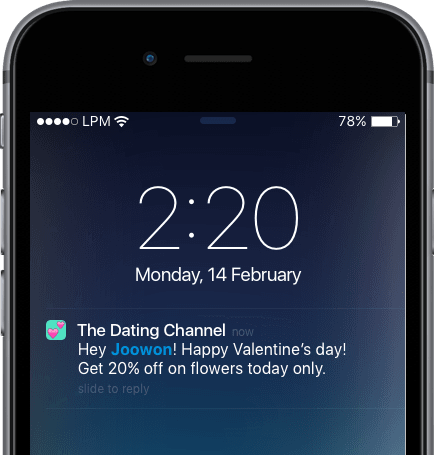 You develop an integrated engagement campaign that reminds users when flowers are on sale. B(l)oom! You’ve converted 20 percent more users by simply letting them know about an app event that would have otherwise gone unnoticed. It might be hard to believe one percent of app users are responsible for 80 percent of the spend, but there’s no denying it. These number one fans deserve just as much attention as they give your app. You likely have a loyalty program running to keep these super users engaged, but how do you retain them? Better yet, how do you get more users to love your app the way your loyal users do? You’re the smartest marketer ever, and have already begun celebrating every achievement as discussed in the previous section. You’ve also identified the characteristics of your power users. Increasing retention within this group is goal one, but there’s also the opportunity to win the love of more just like them. 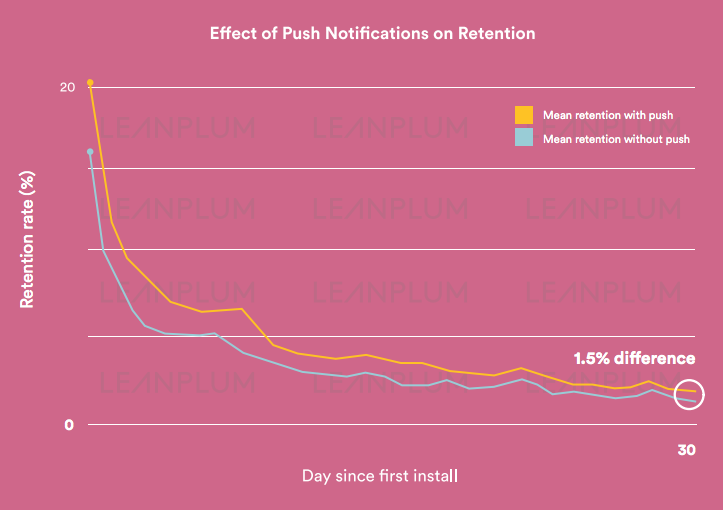 Layering push notifications into your messaging strategy retains 1.5 percent more loyal users in the first month. That’s significant win considering the average retention rate is 7.5 percent by day 30 — 20 percent more loyal users! Your engagement strategy is now equipped with responses to individual behaviors. Here’s a silver lining — if a user isn’t returning to your app, that’s an individual behavior that you can address with push notifications and email. Dormant users can be a challenge to win back, but if you don’t try the answer is always no. No need to ignore them, especially since you can use past behavior to customize messages that remind them why they enjoyed it in the first place. Now they’re the ones that almost got away. Tip: Create lifecycle campaigns that automate re-engagement for dormant users. Messaging just once after they’ve gone MIA is also a case you want to avoid. You can create lifecycle campaigns that automatically send a series of messages that effectively re-engage users. Once the user returns, they can be automatically reassigned to an engaged users campaign that should help keep them coming back again and again. Each of the topics just explained apply to specific moments in a user’s journey. The smart marketer within you now knows to treat the right people like VIPs and celebrate all the happy moments with in-app messages, email, and push notifications. 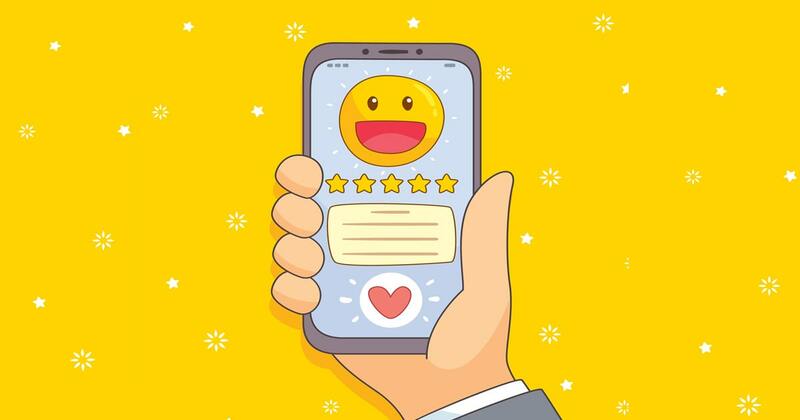 Adopting a multi-touch mobile marketing strategy, both inside the app and out, will give you the BAE you always dreamed of — Better App Engagement. More than the tip: Win App ❤ (& ) With Emojis since they lead to 85 percent higher push open rates and directly influence conversions. Learn more about the entire user lifecycle in our Mobile App Use Cases.